Joe Kauwila captures shark in Hana, 1903. UNUSUAL EXPERIENCE OF NATIVE SAILOR ON THE CLAUDINE WHILE AT HANA. It is not often that any one is towed under water by a shark and lives to tell the tale, but this is precisely what happened last Thursday to Joe Kauwila a native sailor aboard the steamer Claudine. Not only did he survive the experience, but at last accounts he was shoving a truck at the Wilder wharf today helping to load the steamer Claudine with freight. On Thursday at Hana while the Claudine was in the port, the sailors heard that a dead horse had been moored near one of the buoys, for the purpose of attracting a shark. A big shovel nose shark about 12 feet in length, came circling in the vicinity of the horse. Captain Parker took a boat crew and went over by the buoy. J. Welch a man from the shore, shot at the shark with a rifle and struck the shark in the head and evidently stunned it. The idea of Captain Parker and the men in the boat was to get a line on the shark and haul it aboard. There were two young natives in the boat one of them Joe Kauwila. Joe is about 18 years of age and the other man about 20. The shark could be seen a few yards away lying on its back. Some thought the shark had been killed. The natives talked of going over with the line. “I think he no make,” ejaculated one of the men. Seeing a fight between a Shark and a Whale was something entranced the tourists of the Moana Hotel outside of Waikiki at ten o’clock or so in the morning of this past Wednesday. Just as the tourists usually do when staying at that hotel, they often go out to the lanai to watch the steamships leaving Honolulu Harbor, and that is why they gathered on the lanai to watch the departure of the Steamship Alameda. Carl Nakuina’s shark attack news spreads far to Utah, 1917. HONOLULU, T. H., Aug. 30 (by mail).—Honolulu has probably the only man who was ever bitten by a shark in an automobile. If the sentence appears confused, it is nevertheless correct, for both the man and the shark were in the automobile at the time. Shark attack on land, 1917. Bitten by a shark while it was being carried on a car to take to Honolulu to be sold was Carl Nakuina, a worker at the Kalihi Poi Factory. Ke Aloha Aina, Buke XXII, Helu 34, Aoao 4. Augate 24, 1917. 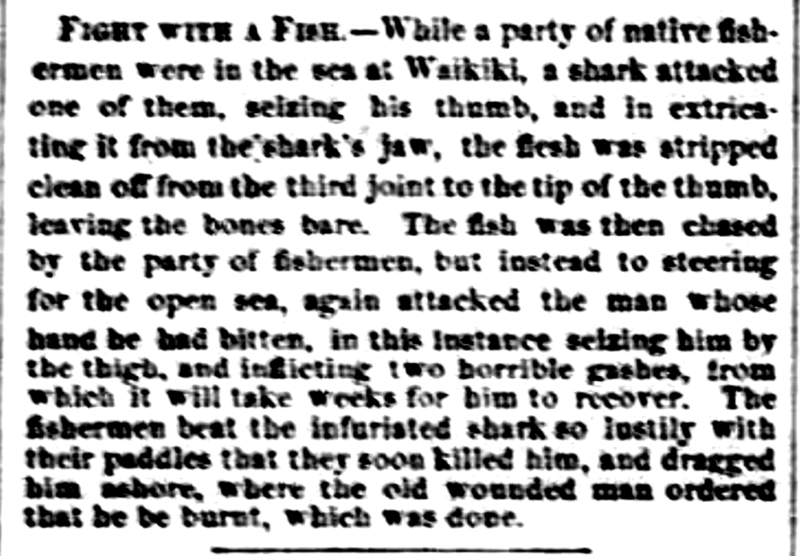 Fight with a Fish.—While a party of native fishermen were in the sea at Waikiki, a shark attacked one of them, seizing his thumb, and in extricating it from the shark’s jaw, the flesh was stripped clean off from the third joint to the tip of the thumb, leaving the bones bare. The fish was then chased by the party of fishermen, but instead to steering for the open sea, again attacked the man whose hand he had bitten, in this instance seizing him by the thigh, and inflicting two horrible gashes, from which it will take weeks for him to recover. The fishermen beat the infuriated shark so lustily with their paddles that they soon killed him, and dragged him ashore, where the old wonded man ordered that he be burnt, which was done. The Hawaiian Gazette, Volume X, Number 20, Page 3. May 20, 1874. John Kaina, Kamehameha senior classman, 1941.